Cannon Falls senior Lindy Edstrom is a successful swimmer on the Northfield swim team and explains her experience at state. Lack of accessibility to an activity shouldn’t be a barrier in the way of someone doing what they love. Smaller high schools may not offer the same wide array of extracurricular opportunities as some of the larger schools, but Lindy Edstrom, a senior at Cannon Falls High School, doesn’t let that stop her from pursuing and excelling at what she loves. Even though she is unable to swim for the Northfield High School team because of Minnesota State High School League regulations, she is still able to swim competitively for Northfield Swim Club. Unlike most high school sports, whose seasons last for maybe a few months, the swim season is a greater commitment, lasting from shortly after the school year begins until the middle of March. 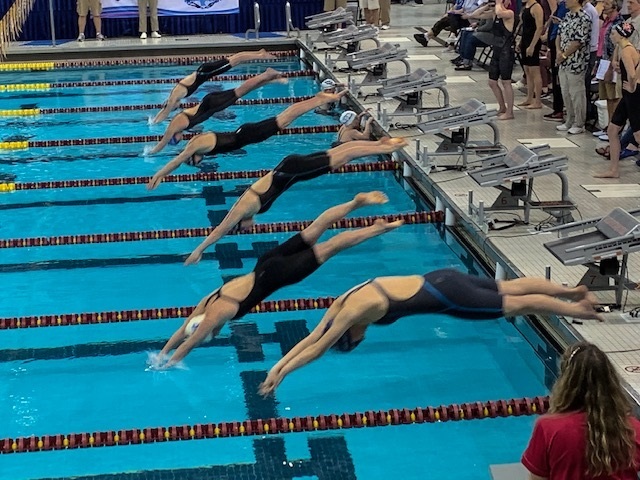 The early part of the season consisted of six regular swim meets, all acting as preparatory opportunities for the season’s climax, Speedo Sectionals, a miniature national meet involving teams from several states, travelling from as far as Arizona and states on the East Coast. This year was Edstrom’s first year qualifying for this rather prestigious swim meet, and she did so in four events. Her successes at the Minnesota Regional Championships, which for club is the equivalent of sections for a high school activity, allowed Edstrom to swim at state in numerous events. Individually at the state meet, Edstrom competed in the 100 yd breaststroke, the 200 yd breaststroke, the 100 yd IM (a race involving all strokes), the 50 yd freestyle, and the 100 yd freestyle. Although she didn’t quite make the cut for finals in any events this time around, as both a sophomore and junior she swam her way into finals for the 100 yd breaststroke and the 200 yd breaststroke. Additionally, the five relays Edstrom played an integral part in achieved team records. Edstrom is proud of how her final season as a highschooler played out, recording best times in both races that were her primary focuses of the season: the 50 yd freestyle and the 100 yd freestyle. She wasn’t overly disappointed at missing out on finals at the state meet because, like many activities around school, the weather wreaked serious havoc on the ability to practice. “With all the snow days, practice was canceled a lot so I didn’t have as much endurance going into the championship meets,” she noted. Edstrom’s achievements in the pool aren’t the only thing that she has taken away from her decade with Northfield Swim Club. Even though nobody else from Cannon Falls competes for NSC, swimming out of another town opened up the possibility of developing new friendships. “Some of my best friends were made because of swimming,” she pointed out. “The sport really relies on support from teammates because of how difficult practices are. The level of commitment swimming requires brings everyone closer,” Edstrom stressed. As she closes the curtains on her successful high school career, Edstrom, like many aspiring athletes, has set her sights on taking her talent and one of her greatest passions beyond her senior year to continue swimming competitively for the MN Swim Club at the University of Minnesota, where she plans on attending college.